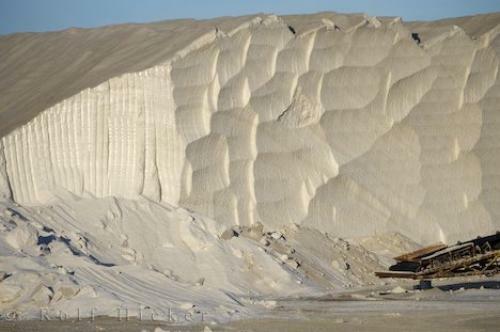 A salt cliff looms over the equipment used in this type of industry in the Parc Naturel Regional de Camargue in Provence, France. The salt cliff in the Parc Naturel Regional de Camargue, Provence in France would not look out of place among the White Cliffs of Dover in England. However, this cliff is part of the huge salt industry of Camargue towering above the equipment. In the old days, the salt from Camargue was loaded on boats, sailed along the Mediterranean and then loaded on mules to travel inland through the mountains.Salt Industry, Parc Naturel Regional de Camargue, Plaine de la Camargue, Camargue, Les Bouches du Rhone, Provence, France, Europe. Photo of a salt cliff and the industry equipment in Parc Naturel Regional de Camargue in Provence, France in Europe.